Jenna's easy queso recipe is the ultimate party dip — and Savannah loves it! This crowd-pleasing dip couldn’t be simpler. With grilling season swiftly approaching, hosts in search of the perfect party dip should look no further. 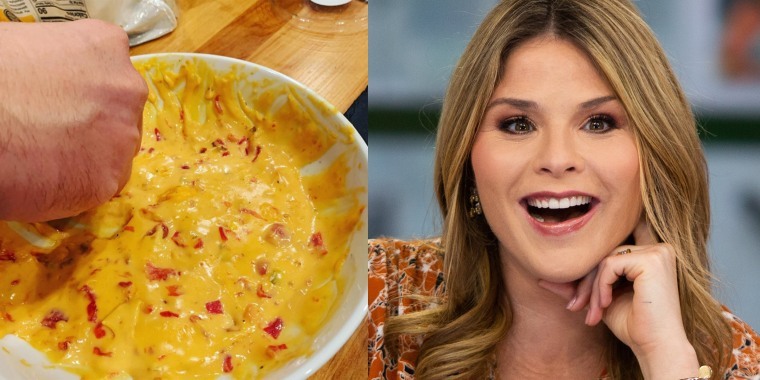 Jenna Bush Hager's favorite crowd-pleasing recipe — a queso dip with a few delicious extras — is incredibly easy to whip up. "I absolutely love queso. Queso is basically considered a food group in Texas," Jenna told TODAY Food. "Growing up, when my mom was tired of cooking, we would go out to eat at least once a week, and it was almost always Mexican, so we ate a lot of queso!" Jenna's revamped recipe is a twist on a popular dish served at The Magnolia Cafe in Austin, Texas, called Mag Mud. And Savannah Guthrie is also a big fan. "It's great because it has everything in there: beans, queso or even meat if you like," Jenna said. "It's probably not the most healthy dish, but who cares about calories when it's so cold outside? This is the perfect comfort food for winter or when you're watching football games." Plus, she added, it couldn't be easier because you basically just dump everything into a pot and it's ready to serve in about 15 minutes. Jenna's queso is definitely a big hit at home: "My husband absolutely loves it." And since Henry likes his queso with a bit of spice, Jenna usually tops his serving with slices of jalapeño peppers. "But the great part about this recipe is that it's so versatile. So for my daughters, I use about half the Ro-tel and always make them their own little portion." A love of queso clearly runs in the family. "My daughters love it! Honestly, they love it so much they tried to eat it with a spoon and thought it was cheese soup," Jenna laughed, "which definitely isn't a bad idea!" We wonder if Hoda Kotb will take a break from her 10-day J.Lo challenge to dip into this cheesy goodness. 1. Preheat a pot over medium heat. Dump in the cubes of Velveeta, the can of Ro-tel and the refried beans. 2. Cook until the cheese melts, about 5 minutes, stirring occasionally. 3. Once the cheese is fully melted, turn the heat to low and add in the sliced avocados. Jenna likes to mix them into the dip, but you can also use them as garnish. 4. Gently pour the dip into a serving bowl and enjoy with your favorite chips — or by the spoonful! Optional: If you love meat, you can substitute the beans for beef or fold this into the original recipe. Saute half a diced onion with ground beef over medium heat. Cook until the beef is browned, about 10 minutes. Drain off any liquid and add 1 packet of taco seasoning. Stir the seasoned ground beef into the melted queso before adding the avocados.